Continue reading for the City’s full press release. The Brooklyn-Queens Expressway. Photo: Wikimedia Commons, Roman Suzuki. Modifications: photo cropped and transformed to black and white. New BQE panel will look at options for replacement of the aging highway, including the triple cantilever structure that supports the Brooklyn Heights Promenade; Panel includes leaders in academia, industry groups, civic organizations, labor and business. 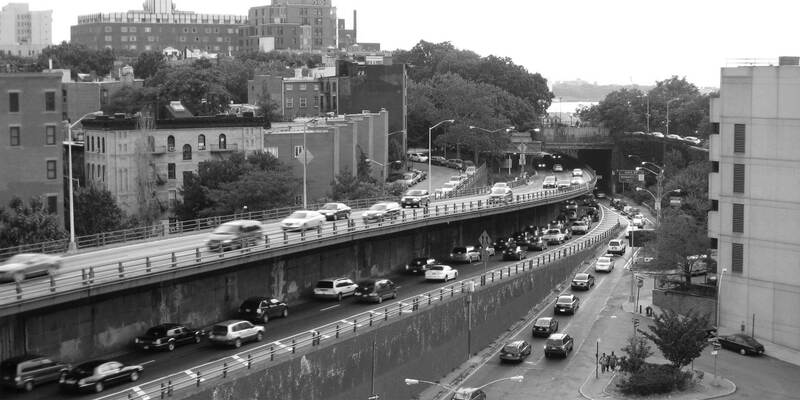 NEW YORK–Mayor Bill de Blasio today announced the formation of a new expert panel to evaluate options for the replacement of the aging Brooklyn-Queens Expressway (BQE) from the Atlantic Avenue interchange to Sands Street in Brooklyn. The new panel will be chaired by Carlo Scissura, President & CEO of The New York Building Congress and will include a range of leaders in the fields of urban planning, engineering, construction, traffic modeling and historic preservation. Panel members’ backgrounds include academia, industry groups, civic organizations, labor, and business. They will consult community groups and elected officials, and evaluate all suggested concepts – as well as provide their own perspectives. They are expected to conclude the process by this summer. The formal environmental process for the BQE reconstruction will take these recommendations into consideration when it begins at the end of 2019. The new BQE Panel was created in consultation with local elected officials and civic associations. It will bring together a group of independent, interdisciplinary experts to evaluate the BQE project assumptions and concepts, with meetings beginning this month. This outside expertise is expected to find new perspectives and ask probing questions on how best to design and implement the BQE reconstruction, one of the largest and most complex infrastructure projects in the entire country. Panel Process: The panel will begin meeting this month, and are expected to produce their conclusions by this summer. It will evaluate underlying project assumptions and review existing proposals, including those that have been generated by elected officials and community members, no-build or reduced capacity options, and other ideas as generated by the panel. The panel will also hear from and consult with a group of elected officials and community, civic, and business associations at key points throughout its review. At the end of the evaluation process, the panel will submit a brief report, outlining key recommendations, which could address both design concepts and construction innovations. BQE – Atlantic to Sands: The approximately 1.5-mile section of the BQE between the Atlantic Avenue Interchange and Sands Street is among the most complex highway structures in the country, and includes the triple-cantilever structure of which the Brooklyn Heights promenade is the top-most tier. Originally constructed by Robert Moses, the road was completed in 1954 and carried fewer than 50,000 vehicles daily when it opened. Today, the roadway is part of Interstate-278, a critical interstate and inter-borough connector – where daily traffic now exceeds 150,000 vehicles including more than 15,000 trucks. An evaluation by outside consultants hired by the New York City Department of Transportation (DOT) concluded in 2016 that if the road is not reconstructed by 2026, weight restrictions may need to be added to the structure – including diverting all truck traffic to local roads. In 2018, a new state law was enacted that will allow the BQE project to be constructed using the Design-Build method, which is expected to save time and money. “How best to reconstruct the BQE has been a tremendous local transportation challenge for some time. I’m pleased to see the formation of this panel, which will help ensure the full universe of options are fairly considered and vetted from a wide range of perspectives. It is imperative that the panel is committed to ensuring the community is fully engaged and stakeholders will provide frequent, meaningful input throughout the process. Overall, I believe this is a positive step that will bring additional transparency to a project that has wide ranging impact on our local neighborhoods and entire city,” said Rep. Nydia M. Velázquez. “My elected colleagues and I have spent months diligently working alongside residents of our communities to ensure that the City must explore all feasible responses to the deterioration of the BQE and identify solutions that minimize the harm to all affected neighborhoods before any approach is approved. The panel the Mayor is convening today in response to our concerns should help the City do just that. This is an opportunity to reset the conversation between the City and our communities. I thank Mayor de Blasio and Commissioner Trottenberg for taking this important step; the members of the panel for their willingness to take on a challenging assignment in the public interest; Congresswoman Velázquez, Assembly Member Simon, and Council Members Levin and Lander for their leadership throughout this process; and the many members of our communities who have engaged constructively on the many difficult issues before us,” said State Senator Brian Kavanagh. “I’m encouraged that the City has heard the concerns of the community and elected officials and that they are pressing the re-set button on the BQE reconstruction plans by bringing in a panel of experts to look at this process more broadly. This is a critical link in our transportation system and we need broad expertise to ensure that we are examining all feasible repair options and innovative ideas for our transportation network. I commend Commissioner Trottenberg for her work on this enormous undertaking and I am grateful to be working closely with my colleagues Councilmember Levin, Senator Kavanagh and Congresswoman Velázquez. I look forward to ensuring that the new panel consults with the affected communities so that their voices are heard throughout this process,” said Assembly Member Jo Anne Simon. “When our community comes together in the name of health and safety, in a united voice, we can be heard. We were heard when we organized to secure design-build authorization for the replacement of the BQE triple cantilever, and we’ve been heard now that we’ve organized out of concern for the initially proposed replacement plan. Now is the time to find a better way to move people through Brooklyn, to design a healthier, more sustainable future. I commend the de Blasio Administration’s decision to take a step back, take in innovative ideas, and take on the best solution that is environmentally sound and supported by our neighbors,” said Brooklyn Borough President Eric Adams. “Ever since the City presented its proposals for rebuilding the BQE, the BHA has called for meaningful community involvement in the planning of this massive transportation project as part of a comprehensive and inclusive approach to involve those who will be most affected by the project. We are gratified that the City has now acknowledged our request by convening an outside panel of experts to take a fresh look at the project and evaluate all of the proposals that have been, or may be, submitted by the community, architects, engineers and planners. The BHA is looking forward to working with the panel to help develop a new BQE plan that will serve the transportation needs of the region into the 21st century and will gain the broad support of the affected communities,” said Peter Bray, Executive Director of the Brooklyn Heights Association. “The CHA is relieved to hear the community and other stakeholders will engage with an expert panel to discuss the entire impact along the entire corridor of the BQE rehabilitation/rebuild. Our concerns in Cobble Hill remain – no through traffic on our local streets, safer on and off ramps at Atlantic Avenue and better quality of life with less toxins in the air and more green space to enjoy the views and gain safe access to the waterfront,” said Amy Breedlove, President of the Cobble Hill Association. “The rehabilitation of the BQE is an urgent transportation priority for Brooklyn residents, businesses, and the thousands of New Yorkers who rely on this major inter-borough artery every day. The project is a complex and challenging undertaking, and I look forward to consulting with NYCDOT and the panel to help ensure this much-needed project is planned with a 21st century traffic perspective to manage traffic effectively and minimize disruption to neighboring communities,” said Regina Myer, President of the Downtown Brooklyn Partnership.